I used the Harold Hahn building method on this model. I first re-sized my hull plans/lines to the proper scale, then used the sections provided to layout the frames. When building the smaller models, I used the hull sections from the plan as bulkheads, inserting an additional bulkhead or two in the front because the curves in the bow needed additional support for the planking. In this larger model, I increased the number of frames by drawing two intermediate frames between each of the sections, to produce a set of frames about 30 in number. 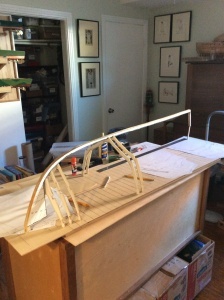 By re-drawing the plans to extend the frames up to a line above, which would represent the building board, I ended up with a set of frames that would allow building the hull upside down and would align easily. 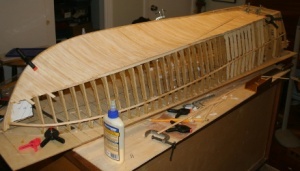 Each frame was glued to the building board and to the keel so that once they were set up, they were pretty rigid and would not distort when the hull was planked. I had done the smaller models similarly, but had cemented the bulkheads to the decking, but in this larger boat, I used a true building board. Once the boat was planked, I just had to cut the hull from the building board, and then trim it along the line of the bulwarks. 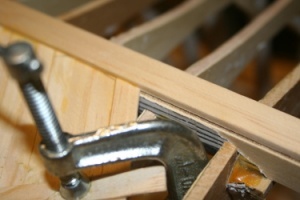 The frames and keel were cut from 1/8″ plywood. 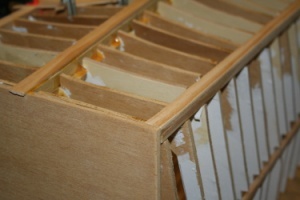 Once the frames were glued to the board and keel, the joints were reinforced with small blocks and later the keel was built up with two wooden strips. This created a small rabbet allowing the first layer of planking to slip beneath it for better strength.